Garde East is excited to launch a series of wine dinners during our 2018 season. Stay tuned for more details! 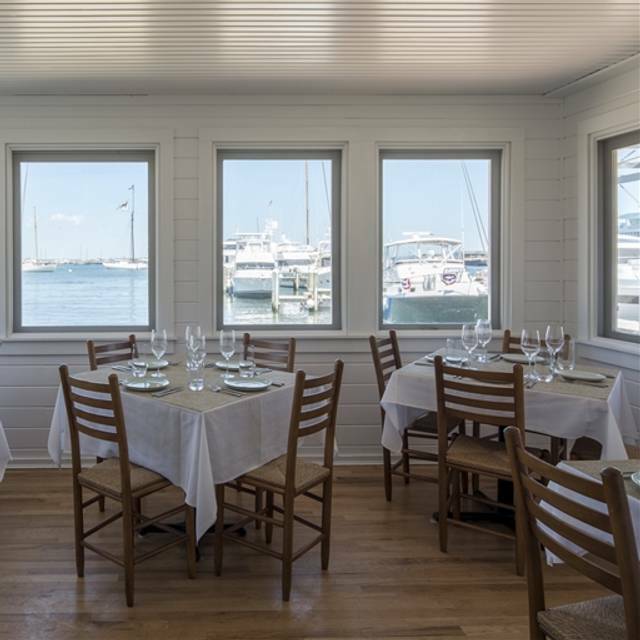 Garde East overlooks the harbor from Vineyard Haven Marina and offers both indoor and outdoor dining in a casual yet elegant setting. Acclaimed local chef Carlos Montoya utilizes the Vineyard bounty from both sea and land in creating his ever-changing menu, with refined and classic techniques. Carefully conceived dishes speak for themselves as the freshest ingredients take center stage to create a truly unique experience. A thoughtfully curated beverage program compliments Chef Montoya’s creations, featuring classic cocktails, craft beers and a wine program of over 400 French and American labels. Reservation was made and confirmed in Open Table. When we arrived the restaurant was closed. How did Open Table allow us to book this reservation? Special Thanksgiving menu was exquisite! Had a lovely autumn lunch here overlooking the harbor from the waterfront room. Three of us tried pasta, gnocchi, and the hamburger, all cooked just right and presented well. Would visit again during midday, as the water view connects you to the Vineyard experience. Service was attentive, friendly, and unhurried. This was a first visit; I had read a very positive review and found that it didn't disappoint. Excellent meal, unexpectedly beautiful setting and attentive service. One of the best meals on the vineyard at the moment. Good food. Oysters were not great. I think they might have had a rookie shucker on. The beet root gnochhi were to die for! This was my second visit to Garde East and it was not a good one. Since it was off season the restaurant was not even half full. I expected attentive service but that is not even close to what we experienced. We were there 15 minutes before the server asked for our drink order and that negligent level of service is what we experienced all night. The table next to us got a lot of attention because the server seemed to know them. Unfortunately for me I was an unknown to him. The steak was just "okay" The cavatelli with lobster was quite good albeit was the portion size of a starter. We had to summon the server for everything. Finally we had enough and decided to go elsewhere for dessert. I won't come back. Have been several times. Food always good. Service friendly and attentive. 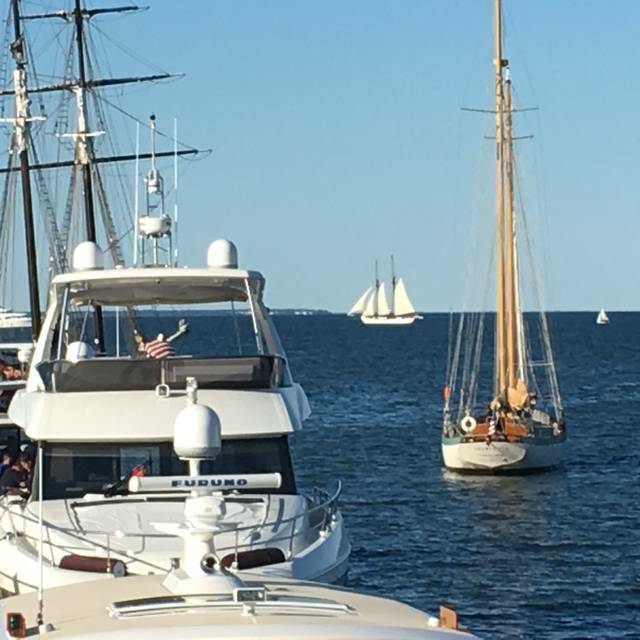 Great location on the harbor. Wish the prices were lower. Great ambience, creative cuisine and staff who were attentive but discrete. 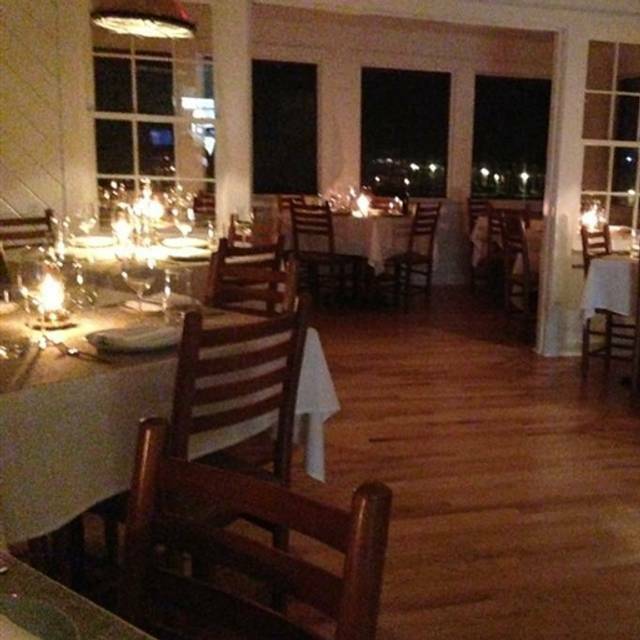 Best dining experience we had in 2 weeks on Martha’s Vineyard. Garde East has a lot going for it. The food was delicious: the chef / menu designer did a fantastic job on flavor and consistency with interesting combinations of familiar ingredients. 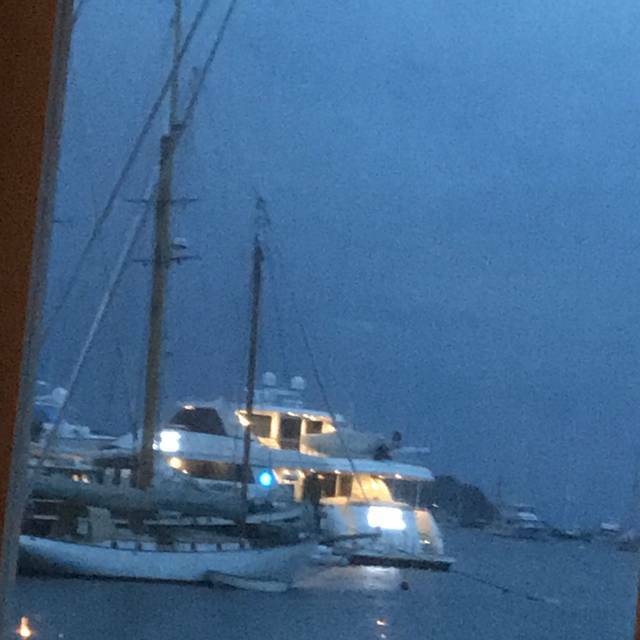 Our table had a lovely view of the harbor. The tables were pretty close together, which presented some challenges for the wait staff getting to each diner (diners seated with their back to the server had difficulty making eye contact with the server unless they turned somewhat awkwardly). The service was slow in some portions of the meal, then very fast in others. It was a busy Wednesday and the space took on a bit of an echo once all the tables were seated. It felt like a new restaurant, so may just be a few kinks to work out as they go. Overall, it was a lovely evening. Fabulous place right on the water! Service was terrific and food was delish! Very nice! Great view and Food. Perfect spot... Wonderful staff. One of the best meals my husband and I have ever had. We were celebrating our mini moon in Martha’s Vineyard and wanted a nice place to eat. We both were so glad that we choose this place. Our waiter was extremely attentive and the food was out of this world! We truly enjoyed dining with you! Our waitress Anastasia was lovely and timed her visits to our table perfectly. 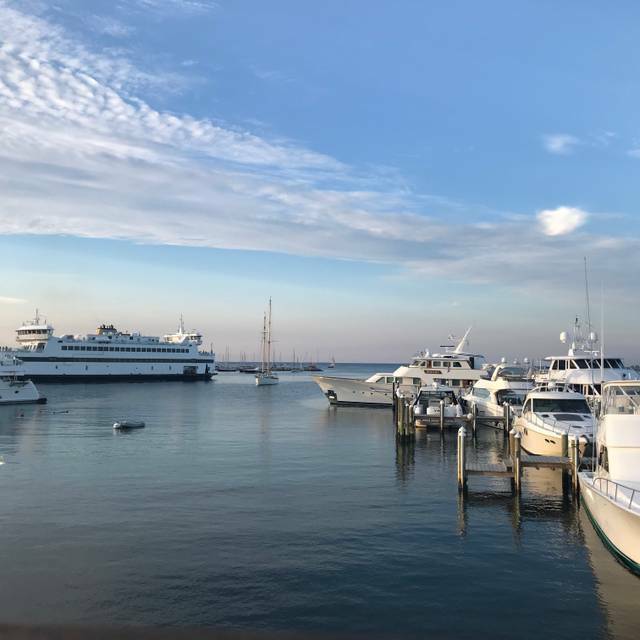 The atmosphere on the upper outside decks offered great views of the harbor and sunsets. Oysters were tasty and fresh, however the mignonette was over powered with too many chopped shallots. We split the Bibb Salad with cran, feta, nuts and local greens. I think they forgot to add the sherry dressing. Salad was crisp and fresh but for the price there could have been a bit more. The feta cran raisins and nuts were non-existent. My date had the sea bass and I had Lobster Cavatelli . Bass was seared nicely and my date really enjoyed. Cavatelli was good but the peas were hard and dry, not small sweet and tender as expected. Gnocchi was cooked just right and sauce exceptional. For the price for these entrees I would have expected more effort from the kitchen. We dined many places during our visit to the vineyard this September and experienced the same around the island; over priced and lacking effort for food presentation and prep. Service across the island was consistently very good. I would revisit next time I’m on the island as I’m sure it may have been an “off night”. Very good food, lovely staff, pretty view and great wine recommendation. 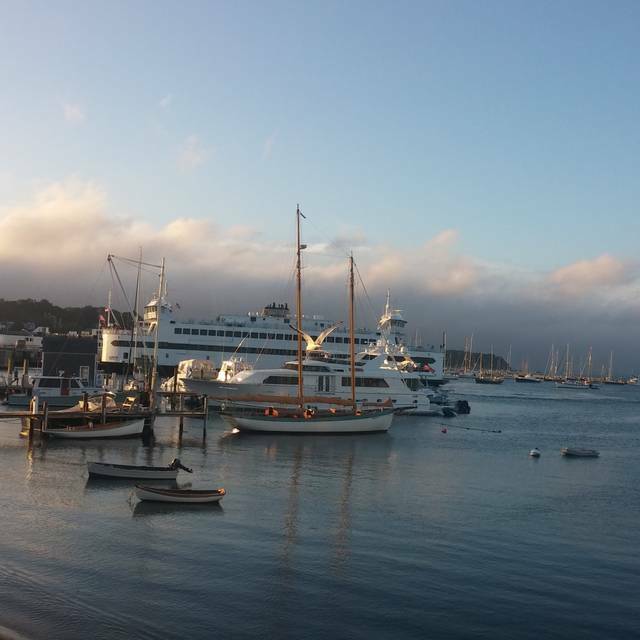 The view is fantastic, overlooking Vineyard Haven harbor. The food was good although the choices were limited compared to what the on line menu indicated. The prices were high compared to the quality of the food, especially for the cocktails. Food was fabulous. A rocky start with slow service, but the charming server and outstanding food made us forget that. Standouts: tuna poke, beet gnocchi, oil poached halibut. Great view from the upstairs dining room. Expensive, but worth the $. We thought it was much better than last summer. We have eaten here 4 times in the last 5 weeks. Food is exceptional and sitting out on the deck is wonderful. Service is unbelievably slow so plan on being there a very long time and waiting 20 minutes to get your drinks. Last night they were not so busy and it still took forever for food and drinks. My salad was delivered to the wrong table, 10 minutes later their two appetizers were delivered to our table and at the end of the night so was their dessert. Service needs a lot of work!! Maybe we will give them another chance next season?? The food at Garde East was very good. We each had a salad-- the one with Bibb lettuce and prosciutto was particularly good, the one with local greens was not so exciting and was sort of dry. Then I had the Lobster Cavatelli which was really good and my friend had Mussels with Curry Coconut Sauce and that was also very good. Very disappointing. Scallop appetizer was just ok. Sea bass undercooked and by the time it was served, was cold. Beef was a very salty marinated flank steak. We were seated at a tiny table for two, even though there were several empty tables of four. Much better options on MV, will not return. 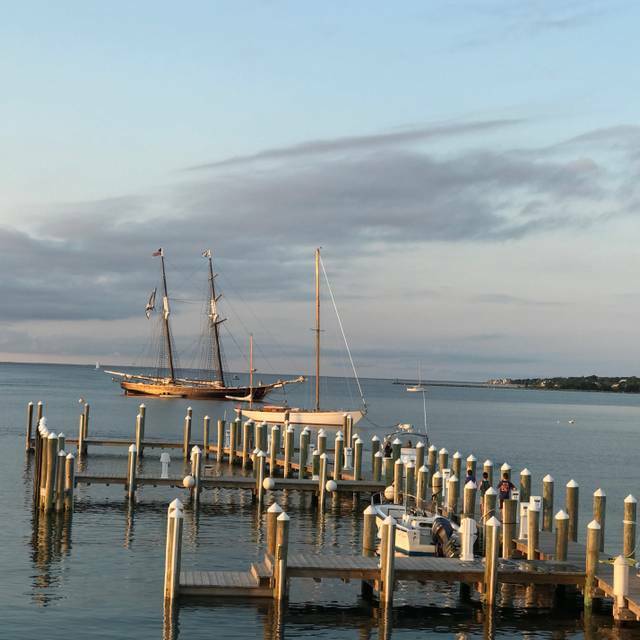 Beautiful view of harbor, great service, fabulous food. We dine periodically at Garde East (3-5 times each summer) and have always enjoyed the food, ambiance and service. Our most recent trip on Aug. 28 was our first disappointing trip (which we hope was a fluke). Our party of four arrived 15 minutes early for our reservation to find that both the main parking lot and overflow lot (across Beach Road) were full. As the hostess desk was unmanned, we had to chase down another member of the waitstaff to ask where we should park, only to be answered with a shrug and a “guess you’ll have to wait around for someone to leave”. After waiting 15 minutes for a spot to open up, we parked and arrived at the hostess desk only to be told that dspite having a reservation, we’d have to wait while they checked to see if a table was available. After another 20 minutes of waiting, we were shown to a table which had grease on the table and chairs, as well as multiple pieces of pasta on the floor from the previous guests. The ensuing 2.5 hour meal was an ordeal of having to chase down our waiter for every stage of the meal (i.e., to learn the specials, to take our order, to get bread for the table, to order a glass of wine with the main course, to get the bill, etc.). We had to wait ~50 minutes between the appetizer plates being cleared and the delivery of our main course. The busboy managing the clearance of plates was rude and seemed completely unaware of when we had or hadn’t received food (i.e., clearing away our bread plates during our 25 minute wait to get the bread - we had to argue with him to get him to leave them). The silver lining was that the kitchen still seems to be doing a good job, but the disappointing service from the waitstaff made for an overall unsatisfactory experience. I’m not sure if I’ll be back to Garde East any time soon, and certainly won’t b recommending it to friends and guests here on the island. This was a superlative meal, by any standards. The food was on par with the best food I’ve had in NYC, Napa, you name it. The view was exceptional; the service was charming and thoughtful, and the atmosphere was delightful. All guests seemed at ease and happy. We went for my wife’s birthday, and we were are utterly pleased. Thank you! Food was excellent. Prices were on the high side. Charging $3 for extra bread was insulting. I hate to give Garde East a bad review because my guess is this is a very special restaurant just not right for my wife and myself. 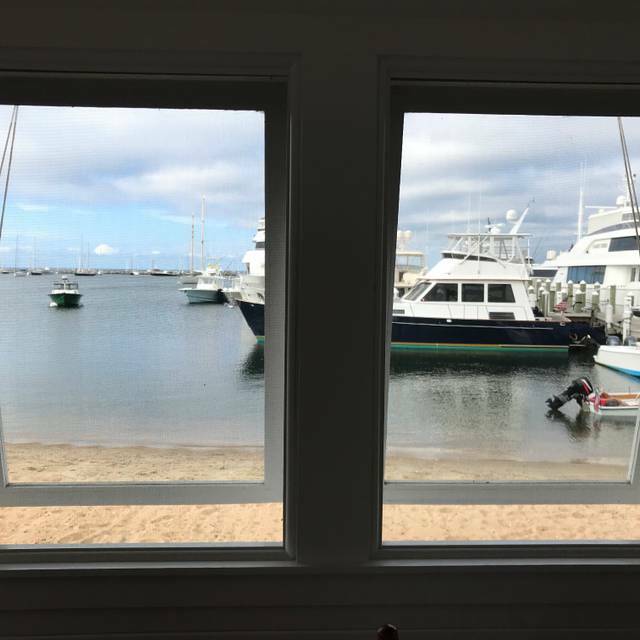 To start the location is amazing with a great view of the harbor. We had reservations at 8 pm and were seated outside with a table lite only by a gas candle. We couldn't read the menu without resorting to pulling out my cell and using the flashlight which I thought was disruptive to other diners but what choice did we have. We found the menu very limited and the prices, which I guess are not out or line for Marthas Vineyard, but made us very uncomfortable. I don't want you to believe that I'm not willing to pay top prices for great food we just didn't see anything that we really wanted to dine on. We both decided there was no entree that we really wanted so we decided to just have a bottle of wine and a couple of appetizers. My steamed mussels were great with fresh bread. My wife ordered the seafood special which unfortunately was mostly raw fish and was not her favorite. In the future I will really check out the next restaurants menu before making a reservation. Everything about Garde East was amazing. It was recommended by a local and did not disappoint. We ate outside overlooking the water (gorgeous!) and the food and service were amazing. Highly recommend! We were 6 and thoroughly enjoyed ourselves - great service and good food. Wonderful evening! Table next to us was drunk, loud and obnoxious. Shouldn’t happen at such a nice place. Four of us dined at Garde East for dinner. We all ordered something different off the menu. Excellent food and location. This is definitely in my top three restaurants on MV. Will definitely be going back again. We enjoyed another wonderful dinner at Garde East. From the initial welcoming to our final good byes at the end of the evening, we couldn’t have asked for much better. The waitstaff is extremely professional and very knowledgeable about all of the intricacies of how the dishes are prepared. The menu is delectable and only slightly seconded by an impressive wine list. 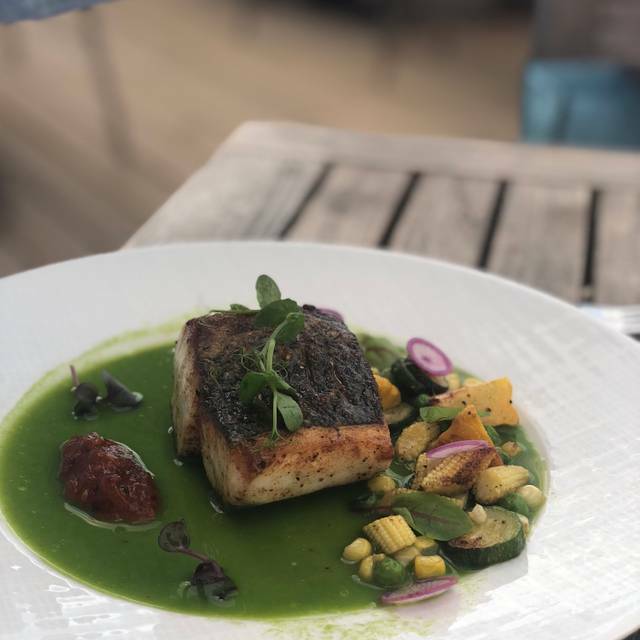 In Garde East, Chef Carlos Montoya had developed a culinary gem that easily competes with the other notable dining establishments on Martha’s Vineyard. We look forward to our next visit. A wonderful night. Great food and fantastic service. A vineyard gem for sure. The table for two was a little small; the waiter was older, experienced, and attentive, the food pretty good. We were early, and the noise level picked up as the evening went on. It was an entirely satisfactory meal and experience. They almost matched my favorite restaurant, but it's not on Martha's Vineyard. Amazing experience. The setting was gorgeous - waterfront dining at sunset with rainbows! And the food was better than some of the amazing dinners we’ve had in NYC. It was overall incredible and we will definitely go back! Wonderful restaurant- Fantastic food, view and service!! Overrated. Terrible service, mediocre food. Make no mistake, this is not fine dining. Many other options close by, look elsewhere. Food was fine. There were not a lot of selections however. Service was NOT fine. We sat for 1/2 hour before anyone came to take our drink order. Server was not friendly at all. It set the stage for an unenjoyable evening, when in fact the occasion was a very important occasion.